"Pete" Rasar was born in Carter County, Tennessee in 1853, the family migrating to Blount County around the time of the Civil War. Peter's father, Daniel Rasar served the Union Army during the Civil War, and his mother Sarah Peters Rasar was left at home to raise their family of 9 children. Peter came to Washington State between 1882 and 1884. It is believed he traveled across country by train to Seattle and then by boat/steamer to LaConner. From LaConner he traveled to Edison and settled in the Skagit County. Pete settled on the Samish flats near Edison, returning only twice to his native Tennessee. He returned to Tennessee to wed his first wife, Allie Kerr. They had two children. 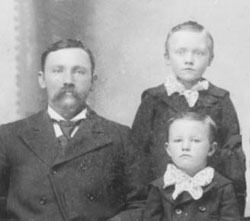 William and Carl were toddlers when their mother died in 1896. William died at an early age from Diphtheria. 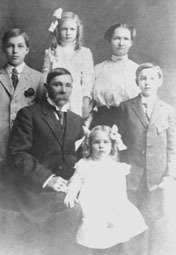 Peter returned to Tennessee, marrying his second wife Docia Elizabeth Blevens in 1898. Peter and Docia had four more children, all born in the Edison area. Sons Daniel and Robert, and daughters May (Hanstead) and Jessie (Dowen). In 1900 Peter purchased farmland in the Samish flats. Over the many years, the property was cleared, and Peter had a small sawmill on his property, with a train stop for the Interurban railroad. Many of the neighbors and farmers in the area, helping each other to clear the land and prepare it for farming, utilized this venture. Peter ventured forth with raising a small herd of cattle, and raising crops on the land once it had been cleared, and was an active member of the Darigold association. Peter carried a family knowledge of the lumber industry, as his father Daniel Rasar was in patnership in many grist and sawmills in the Montvale to Alleghany vicinities in Tennessee. 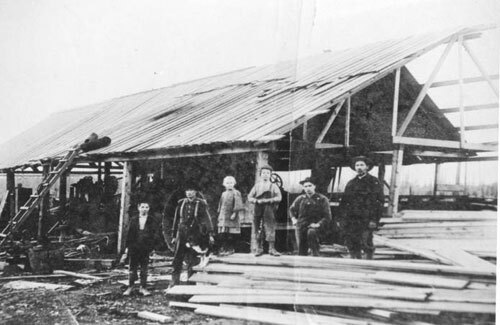 Here are shown piles of lumber produced at The Rasar Family sawmill, near Edison, Washington, on the old interurban rail line, which is now Chuckanut Drive. Residents of the Bow/Edison area brought in their own trees to have the mill cut it for use in building their homes. All of the Rasar children grew to adulthood, married and raised families in Skagit County. The last survivor of this generation of Rasars passed away in 1999. Carl married Anna Petersen of Iowa. They had three children; Raymond, and Alice are both deceased, and there is one living daughter. Daniel married Goldie Adema of Michigan. They had five children, all of whom are alive and living in Washington State. Daniel's son Dan Rasar donated the property for Rasar State Park. Robert married Myrtle Long of Tennessee. They had five children. Robert, Jr and Ernest are deceased, and there are 2 sons and 1 daughter still living. May married (1) Harold Gower and (2) Ernest "Tony" Hanstead. She had two children. A son Robert 'Bob" is deceased and there is 1 living daughter. Jessie married Frank Dowen of Michigan and two sons, Ronald and Claude, both of whom are deceased. Each of the children married and had families. Many of their descendants are still living in Skagit County. Peter's nephews, Raymond Rasar and John Carl Rasor also emigrated and settled in other areas of Washington State. 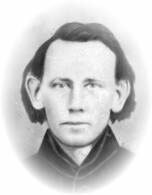 Raymond Rasar and his family eventually settled in Skagit County while John Rasor settled near the Oregon border. A niece Eliza Holder also emigrated to Skagit County and was married to Lon Harrison, in the Lyman/ Hamilton area. This bookmark was given to Rasar family members to commemorate-ate the opening of RASAR STATE PARK. Dan Rasar is a longtime Skagit County resident and grandson of Skagit County pioneers. He currently lives in Redmond, Washington, but returns frequently to the Skagit Valley, and owns a home on Samish Island. He grew up in the Bow-Edison area, graduating from Burlington Edison High School and Western Washington University. 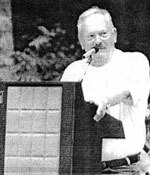 He was an entrepreneur, owning many Shakey's Pizza franchises from Auburn to Fairbanks, Alaska. Dan says "Everybody that chomped on a Shakey's Pizza from the late 60s until 1985 helped build the park." According to state policy the people who donate property are given first priority in naming the new enterprise. Dan chose to name the park for his pioneer grandfather, Peter Rasar, on behalf of the Rasar families in Skagit County. As our Skagit County pioneer, Peter is the earliest known member of this family to emigrate to Washington State. Daniel Rasar purchased the property along the Skagit River about 30 years ago. His original intent was to parcel the property, sell a portion of it, build a home and retire in this remote area of Skagit County, along the wild and scenic Skagit River. The property is located along the north shore of the Skagit River approximately 20 miles east of I-5. At some point in time, Dan determined that this spot along the river would make an ideal setting for a park, to preserve the natural beauty and forested landscape. Looking around the breathtaking scenery on the site, Dan commented "We want to share it with the public, this is the right thing to do." In 1984, Dan Rasar donated the parcel of land [128 acres] to the Washington State Parks Department. Several legislators, and dignitaries of the State Facilities and Financing Committee for the Governor, and Parks Assistant Regional 2 Supervisor, Jim Collins visited the area and determined that the land would indeed make an ideal park, indicating that the property would be given a high priority for funding. However, this was an extremely slow process and it took almost 10 years before the funding became available to develop the site. In 1991 money was approved by the state Parks and Recreation Commission to begin development of the park, with construction to begin in 1993. However, the park was not completed and available for public use until 1997. Rasar State Park was dedicated on July 12, 1997 with hundreds of people gathered to enjoy Bluegrass music, a stroll along the Skagit River bottom. The park was the first new state park to open in Western Washington in over 15 years. Speaking in her native tongue, Vi Hilbert of the Upper Skagit Tribe thanked the Rasar family for their generosity in returning the area to the people. Vi Hilbert, an international language historian and lecturer, told stories of when her grandfather had a longhouse along the river in that area. Construction actually began in 1995. The park is on two levels with the upper level housing restrooms, picnic shelters, playgrounds, roads and campsites. The lower portion has been left largely undisturbed to provide pristine hiking opportunities. The ceremonies concluded with the releasing of a rehabilitated raptor Eagle by Help Our Wildlife Rehabilitation Center. The Park is one of the few parks in the Washington State Parks and Recreation system that is not on the reservation list. The park is open year-round for camping and day use, and offers playground equipment for kids. There are second-growth trees and ample opportunities for nature study. The boulders and wood used in the buildings at the park were milled on-site from materials located within the park itself. In the development of the park, colored rocks removed from the rivers bed and from within the property and lumber taken from many of the trees felled during clearing were used in the raising of buildings on the park site. All trails within the park were developed by the Job Conservation Corps. The park has 18 standard sites, 20 utility sites with electricity and water, eight walk-in sites and three primitive hiker/biker sites, as well as two Adirondack (three-sided) sleeping shelters available to walk-in campers. All campsites are first-come, first-served. There are three ADA-accessible restrooms (two with showers). Rasar State Park has picnic sites, a kitchen shelter that can be reserved, 17 standard campsites and 22 utility campsites. The park also has 10 walk-in tent sites and three hiker-biker sites. There is also a trailer dumping station, a shop, garage and seasonal ranger. Nature Hiking Trails One trail, about an eighth of a mile long, is paved and designed especially to accommodate physically challenged campers. Braille-like speed bumps are embedded in the trail. The trails add up to about three miles, but the 4,000 feet of trail along the Skagit River make up in quality what the trails lack in quantity. Much of the physical labor in getting the park ready for campers was done by teens from the Indian Ridge Youth Camp in Arlington. Doug Villager, a forest crew supervisor for the state Department of Natural Resources, led a crew of five young men from Washington Conservation Job Corps. Most of the chores they performed were for esthetics. The park has been developed in three (3) plateaus with trails equipped with hand rails and wheelchair accessible from the third plateau to the second plateau. The third plateau allows access to the river bank, but is not being developed due to flooding in the area when the river is high. The second plateau is called the hayfield and neighboring farmers are allowed to use the property to make hay with a guarantee that they would keep the hayfield/pasture mowed during high use times of the park. Across the highway from the park are two short trails you can sample, as well as nicely spaced camping sites with tables and restrooms available. The Sauk Springs Trail is a short loop that passes the biggest cedar tree I've ever seen, and the Skagit View Trail (another short loop) is wheelchair accessible. From the day-use area, a paved trail descends to a hayfield and a display describing how loggers and farmers settled the Skagit River valley. Some portions of the farm still work today to preserve the valley's farming legacy. The well-kept trail wanders through a rain forest like setting of ferns and moss, cottonwoods, cedars, alders and Douglas firs. The paved path ends at the riverbank with a trail heading in both directions along the river. The trails eventually loop back through the forest to the parking lot. Skagit River Trail and loops, about three miles round trip, minimal elevation gain. The park is currently on a first come, first served basis, but plans are to eventually place the park on the State Park Reservation Service. It is estimated that the park will have 200,000-400,000 visits per year. The park has been placed on the Washington State Parks Website.